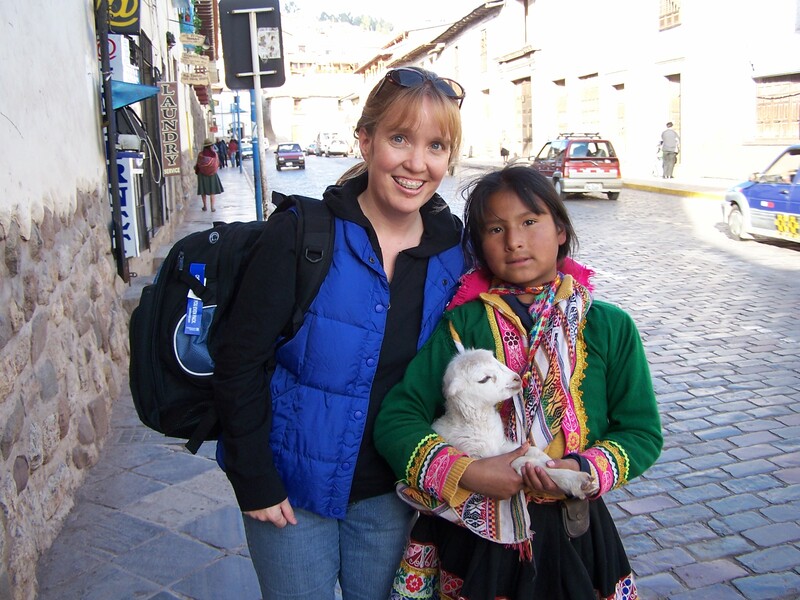 It started in Puno, Peru, after we returned from our day on the lake. In an all-too-familiar theme, we learned that our flight from Juliaca to Lima (Juliaca is 45 minutes from Puno), was probably not leaving at 2:40-ish, but two hours later. Hmm. Good to know. So the next morning, we woke up, packed our bags, stored them in the hostel’s luggage room, and confirmed our flight to Lima. 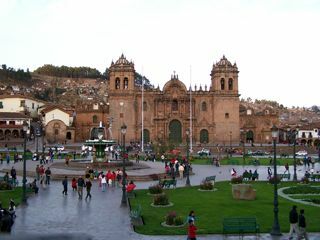 We walked around the “plaza de armas” of Puno, took photos of people in the square, then of the cathedral. This cathedral facade was one of my favorites. The intricate details, the perfect sky in the background, the three Peruvian women sitting on the cathedral step sewing and trying to sell their goods. The facade had so many details that I’d love to know about. One was a large cat on both sides of the cathedral door. So I asked the three women if that was supposed to be a puma. 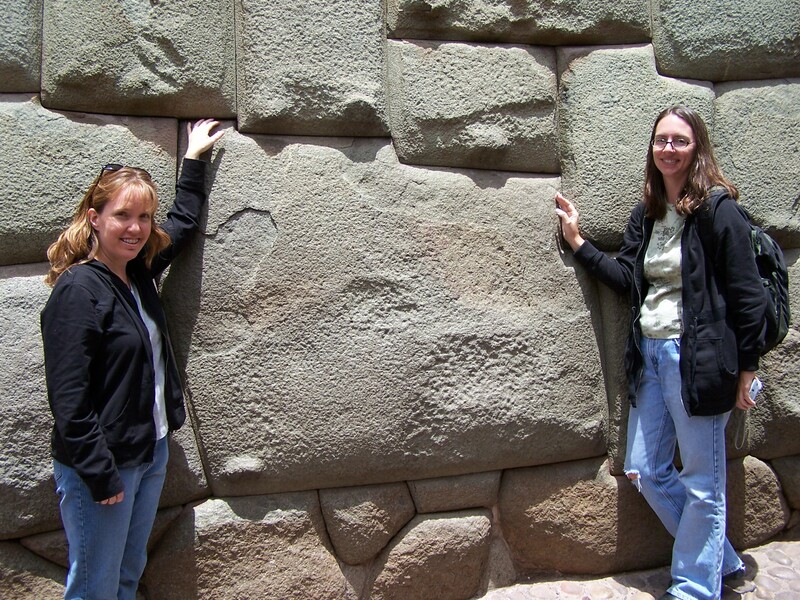 (Pumas hold significance for Peruvians, and especially in Puno…and unfortunately I have forgotten what it is right now.) They weren’t sure, then decided that yes, it must be a puma. The inside of the cathedral was also interesting, though I preferred the facade, so I went back outside, and took several photos. I wanted a good view of the sky and the cathedral facade, so laid down on the ground to take my photo. I sat up and saw the three ladies were laughing at me, smiling, curious about what I was doing. So I showed them the photos I had taken and they were impressed. “Ooh..” … “Aah…”… “some souvenirs to take home as remembrances” they said. I wish I had taken their photo and address, to send them some photos. We eventually found the shuttle office, reserved three spots, and continued wandering around Puno until it was time to get ready. In a strange South American moment, the shuttle arrived 15 minutes early! Our new friend Tommy, whom we met on the shuttle, informed us that he had been picked up 45 minutes before that, and was being chauffered around Puno, not sure what was going on. This continued until the shuttle was full… and we made our way to Juliaca. Our flight from Juliaca to Lima (via Arequipa) was fairly uneventful, except the gorgeous scenery outside the window, and the incredibly rude flight attendants.. but once in Lima, we couldn’t find Continental Airlines. Oh, someone told us, they open at 7:30. It was now around 6:45 or so, I think. We waited around, with Tommy, whose Air Canada line was not supposed to open until 9-ish. Finally, there was some life at the booth where we were told Continental would open. We waited in line until a representative informed us that our Lima–Houston flight would be two hours late. Oh joy. That meant we’d be missing our Houston–Chicago connection. Which meant less probability of Jim and Cathy making our church meeting on Tuesday night in Madison! But our Continental Agent, Franz, booked our new connections, so we felt ok that at least we had a new flight. After we checked our bags, we went to the food court, where Jim had his Big Mac.. and I ate a McNifica. Jim likes to try McDonald’s in different countries, and I was happy just to have some food. I went to the internet center to let Madison know that we might not make our meeting…Jim and Jo Ann went through security and waited for me. And we waited, and waited and waited… Finally, we boarded our plane, and I was asleep even before we left the gate, I think. Our flight left around 1:20 am, Tuesday morning. A while later, around 2 am, I woke up to the word “heart attack”. What?! A flight attendant was explaining to Jo Ann that someone in first class was having a heart attack, and we would be landing in Guayaquil, Ecuador, for a medical emergency. The pilot announced the emergency landing, but only said that there was a medical condition… and later we found out that the first class passenger was having panic attacks and irregular heartbeats, enough to lead to a heart attack. But they had to remove her by force off the plane in Ecuador, because they couldn’t risk that possibility, even though she wanted to get home. We finally made it to Houston, having now missed our second Houston-Chicago connection. But amazingly, in Houston, Continental had a counter all set up by baggage, with all our newly-arranged-connecting flights already on boarding passes for us. Thank you, Continental! It was a strange, surreal night… fortunately the passenger with the medical conditions was ok, we found out, and so we are able to laugh about the incident. We missed our Madison meeting… Jo Ann, who had been quite sick on the last day and a half in Peru, was feeling slightly better, while I was feeling pretty sick… on the drive home from Chicago to Madison I slept in the back seat the whole way, waking only when we arrived home. It’s not everyday that we get to go to Peru. It’s not everyday that we stop in Ecuador on our way home from a trip. It’s not everyday that we have such crazy stories to tell. But now it is everyday that I think about Peru, about our trip, about the people we met, and wish.. that I could do it all over again. Or, at least most of it. Perhaps not all. Lake Titicaca, pronounced by some as “Lake Titijaja” (kind of) was honestly not the spot I was most looking forward to. I had read, heard, and thought, that the lake and its islands were giant tourist traps. A little tacky, I had read, a little too much. I expected to like the boat ride, because I almost always like boat rides. But I was surprised to have liked the lake, and especially the Uros Islands. We embarked on a crowded boat (seating around 30-40 people? ), sat at the front, with a view of the captain, and our new friend Sandra, from Australia. We were allowed to go to the top of the boat as well, but it was too chilly at least on the outgoing part of the trip. After about 45 minutes of slow boat travel, we were nearing the reed islands–the Uros, and other reed islands. These islands are literally made from the tortora reeds surrounding the area. Thus, the slow-going boat ride at the beginning of the trip. The reeds provide the island, the building supplies for homes, the souvenirs, and are even edible. Not that tasty, but not bad taste either, really. The islands were originally created so the Uros people could escape Inkan invaders coming into the area. Clever. As the reeds disintegrate, they add more reeds to the top of the islands. As we sat on a reed “bench”, listening to the history of the islands, I snapped photos around, in front of, and behind me. There was some funny bird making all kinds of squawking noise from the door of its reed bird-house. Other tourists and island natives climbed the reed towers. Some got on the reed boats, others walked around, and several of the Uros people set up their “tiendas”, where they sat and waited for the tourists to be done listening to the talk, so we could buy. One lady was winking at me, while sitting at her spot, embroidering. I smiled at her, and waved. She was smart. Pretty soon she came and sat next to Jo Ann, and non-verbally engaged both Jo Ann and me (I was sitting to Jo Ann’s left) in her work. Later we found out her name is Celia. 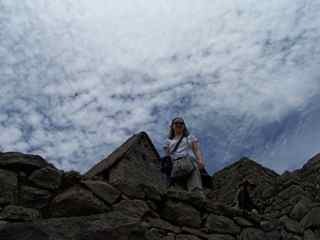 When we were free to explore, Jim went to climb up one of the reed towers, while Jo Ann and I went to look at Celia’s handiwork. We talked with her, asking her about her work, and finally each of us bought a pillowcase. I had a hard time choosing between an embroidered picture of a lady cooking fish, or an embroidered picture of the interesting birds and the reeds. I asked her if the lady in the first one was her, and she said yes. Then I asked her which pillowcase she liked better, the one of her cooking, or the one of the bird and reeds. She said the first one, so that’s the one I bought. Jo Ann and I climbed the reed tower, for a view of the island. Jim and New Zealand were trying to find guinea pigs. Then we also got our turn on a reed boat, and Jim and I got to help row. It was a tourist trap… even the boat ride. Three kids accompanied us on the boat, with their father. Two of them rowed until we helped them, then they let the tourists do most of it. But then the older kid broke out into song, singing “Twinkle, Twinkle, Little Star”. Cute. Several of us began singing with them. Then the kids sang in their native language, and afterwards, asked for money for the singing. Yes, a tourist trap. And yet, somehow I wasn’t highly offended. We laughed about it. But perhaps I wasn’t so offended because in the short time that I had been on that island, I wanted to know more.. more of the people, more about Celia, I wanted to watch her work, I wanted to hear stories and find out how it is to live on that reed island for years. And I wouldn’t mind learning how to make one of those reed boats either. After the reed islands, we got back on our boat and motored out to Taquile Island, about two or more hours from Puno. Taquile has beauty, no doubt. Architecture, culture, animals, a hike up the hill to the top of the island, a weaving cultural center, and even a restaurant or two. Good food. On the way back down the island to the boat, we walked down 500 + steps to the harbor. Along the way, along the whole island, we were faced with more vendors asking us to buy little things. And more smiles. And more sheep, cows, but no llamas. (Sadly. Although two little boys did tell me that there are llamas on the island.) Now that I’m writing about Taquile, I am realizing how much I did like Taquile as well, though Uros was clearly my favorite. Have I mentioned that I love traveling? 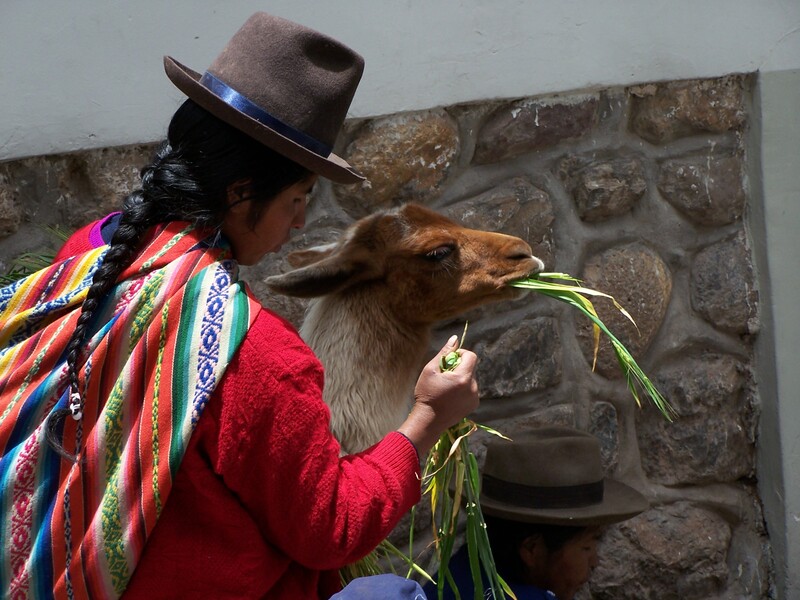 We´re in Aguas Calientes, the ¨Machu Picchu Town¨as it is also known. A small town where tourists probably wouldn´t come, except for their visit to Machu Picchu. In fact, it has become more of a town because of MP. I actually like it. But then again, I also like Panajachel, Guatemala, a touristy town. I like seeing the hippies, the Guatemalans, or in this case Peruvians, selling their work… I like seeing what´s being built (apparently a lot now that Machu Picchu is one of the new 7 wonders of the world). It´s quite the scene. Tonight we ate a typical Peruvian cuisine, including appetizer/soup, entree/and juice/tea, coca tea. For appetizer I ate Stuffed Avocado… incredible. Stuffed with tomatoes, cut green beans, cheese, mayonnaise, and some good-but-unidentifiable other stuff. Then for entree I had ¨Lomo Saltado¨: beef strips, bell pepper strips, onions, a good sauce.. hmm.. Very good. Jo Ann ate a potato dish and a fileted (sp?) breaded chicken. Jim had Quinua Soup and, get ready to gasp, Grilled Alpaca. He said it was good. But I´m sure you didn´t want to read about our food intake today. 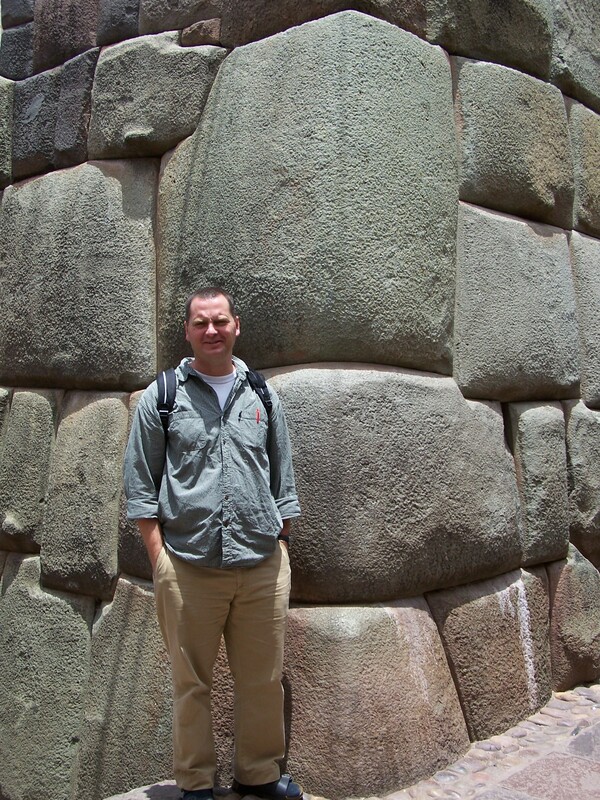 So, Machu Picchu… and the train ride to Machu Picchu… oh, wow. The train did some weird stuff starting out, such as the switchback… three times, the train went forward a ways, then backwards. The first time it happened I honestly thought we were going back to pick someone else up, or to fix something wrong. Turns out that no, it´s just easier on shorter trains to do the switchback instead of turning corners quickly. The terrain/vegetation was strange.. we went through farmland, desert, and what appeared to be jungle yet with Dr. Seuss-like evergreens, orchids, tropical plants, then ferns, impatiens, geraniums… it just did not make sense, but was very pretty. Once we got into our hotel (Wiracocha, and our roon number is ¨9¨, but our wooden key has ¨6¨on it. As long as they keep it straight), we bought our bus tickets for MP. The park, Machu Picchu is fabulous and phenomenal, and there were far too many tourists for my comfort level.. Plus that meant that most of our photos have tourists in them. Tourists besides us, I mean. Oh well. Anyhow, it was gorgeous, immense, incredible, awe-inspiring, crazy, intriguing, exhausting (the hiking up and down stairways). The highlight for me? Petting llamas. No, they did not really want to be pet. One, in escaping my pets, ran and almost ran into another tourist, but got scared, and jumped-spread eagle-over a rock. Unfortunately none of us got that on camera. But it really happened. Anyhow, the llamas were fantastic, even though they didn´t really want to be around people. We got lots of photos, which I can´t upload now because these computers are quite slow. And on that note, I must go now. Computers are slow. We´re tired, and leaving on the first bus tomorrow (5:30 am) to return to MP… to climb a peak. And I can´t remember how to spell it now. Later. Then tomorrow evening we return to Cuzco on the train, and head to Puno (Lake Titicaca) the following morning… also quite early. 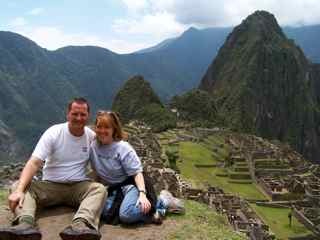 We have to get up quite early tomorrow to catch our train to Aguas Calientes/Machu Picchu. But it´s been a good day of exploring Cuzco, walking a lot, eating a lot, talking to people, taking photos, taking a nap, drinking lots of water, some really good coffee in a cafe… good day. Here are a few pictures. I think they will appear huge at first, then wait and they should diminish in size. I think… I hope..